Chronicle during the first 30 minutes might be boring to most people. Just like any other found footage films, a slow start is expected. 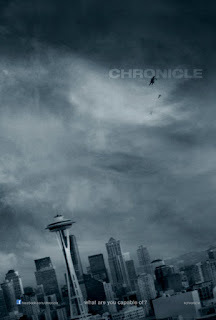 But when the turning point of the plot was finally revealed, Chronicle was clearly separated to any other found footage film ever shown. Found footage gives you a feel that you were there when the events unfolded, No Hollywood acting here, no cheesy/epic lines to be delivered. It's really like an amateur video capturing real events. Some might not like how the film was delivered, but to the likes of me who usually watch superhero flicks like those made by Marvel and DC will have a fresh feel on this one. The story is not that long but you'll get the moral of the story clearly without those expensive Hollywood effects and orchestral score accompanying it. Give this movie a try, and I will guarantee you that it will be your money's worth.